and are waiting to be discovered by humans. 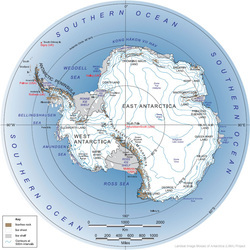 The existence of the civilization in Antarctica started drawing attention of professional historians after the World War II. The hypothesis can be proven by medieval maps and the research of Western paleogeologists and glaciologists. In January 1820 the lieutenant of the Russian Imperial Fleet Mikhail Lazarev discovered a new continent. At the beginning of the 20th century famous Russian Brockhaus and Efron encyclopedic dictionary contained an article, according to which the continent was insufficiently and that there were no flora and fauna. Besides, the author mentioned the variety of seaweeds and sea animals that inhabited the Antarctic waters. About twenty years later the head of the Istanbul National Museum Halil Edhem found an old map while revising the library of Byzantine emperors in the old sultans palace. The author of the map depicted the Western coast of Africa, the Southern coast of South America and the Northern coast of Antarctica. Halil was astonished. The ice edge of the Queen Maud Land south of 70th parallel was free of ice. The author mapped a mountain chain at this point. The name of the cartographer was well known to Edhem. It was the admiral of Ottoman Empire Fleet Piri Reis, who lived in the first half of the 16th century. In 1949 the joint British-Swedish expedition conducted a thorough seismic exploration of the southernmost continent through the thick ice. The results coincided with the map of Reis. However, it was a mystery how the map data were to agree with the level of science of 1513. Piri Reis himself explained on the margins of the map that it was based on previous sources, some of which belonged to his contemporaries, while others could be dated with as early as the 4th century B.C. One of the sources, for instance, belonged to Alexander the Great. Thus Reis could not be made responsible for the data presented on the map. Medieval maps show Antarctica without ice cover or partly covered with ice. The accuracy of maps of the 16th century is incredible. In terms of the technical means their data can be compared with those of the end of the 18th century and sometimes with those of the 20th century. According to the Reis' map the coastal edge of the continent is not covered with ice. Oronteus Finius's map that was composed 18 years later shows a plateau around the South Pole within the 80th and sometimes 75th parallels. 200 years later academician Buache depicted Antarctica without the ice. In 1949 the Admiral Richard E. Byrd's expedition was drilling the Ross Sea bottom approximately in those places where Finius marked the riverbeds. The cores contained fine-grained rocks, well-mixed deposits, brought into the sea by the rivers, the heads of which are located in the middle latitudes (i.e. not covered with ice). 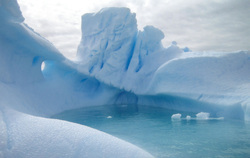 Scientists of Carnegie Institute of Washington managed to establish precisely that Antarctic rivers that contained these deposits were flowing about 6000 years ago. Only after that, about 4000 B.C. the ice began accumulating at the bottom of the sea. This fact was preceded by a long period of warmth. 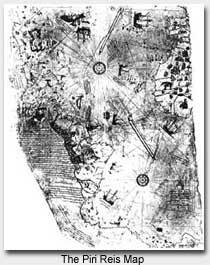 As a result, the maps mentioned above depict Antarctica of the period when Egyptian and Sumerian civilizations were born. Most of the historians disclaim this point of view. However, there is a hypothesis that between the fifth and the tenth millenniums B.C. a human civilization lived on the planet. It possessed great knowledge in navigation, cartography, astronomy, thó level of which was not lower then of that of the 18th century. This civilization was rather a predecessor of the ours than a product created by aliens. Its age could be several millenniums. It was probably located on the northern coast of the southernmost continent or the archipelago of large islands - that was Antarctica that had a moderate climate at that time. Later it could occupy the northeast of the African continent. The civilization could have disappeared because of the icing up of the southern land that began not earlier than in the tenth millennium B.C. Another possible reason could be large inundations that led to long-lasting local floods, which are not disclaimed by archaeologists. Such natural disasters could destroy almost the whole material culture of the protocivilization. It can be possible that some part of it is covered with thick Antarctic ice. Another possibility is that some of the representatives of this protocivilization could have survived. In this case they could have pass their knowledge to Egyptians and Sumerians. Humans cannot but hope that further archaeological research will solve the mysteries of the southernmost continent. There could be lots of surprises hidden here.
" WASHINGTON (AMP) - A spy satellite image of Antarctica reveals an "anomaly" two miles beneath the ice that could be a man-made structure, according to Congressional investigators who are demanding release of the image from the Pentagon. The explosive revelation about the anomaly, loca..."
WASHINGTON (AMP) - A spy satellite image of Antarctica reveals an "anomaly" two miles beneath the ice that could be a man-made structure, according to Congressional investigators who are demanding release of the image from the Pentagon. 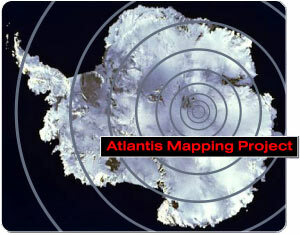 The explosive revelation about the anomaly, located at the epicenter of recent seismic activity in East Antarctica, prompted an immediate denial from the Defense Department and feverish speculation among members of the international intelligence and archeological communities.